2016 has been a fairly decent year for cinema so far. I found it to be particularly strong in the independent cinema front or perhaps my taste is learning more towards more unseen releases. Either way I decided to put together a cliché list of my favorite films that I see throughout the year. Below is the second. If this gives you any indication of her unique artistic abilities, it is no surprise than when she announced a feature length film I was extremely excited. Heart of a Dog takes traits of Anderson’s previous works and combines them into a poetic exploration of image and emotion. The film travels down many philosophical avenues, but her beloved terrier Lolabelle is very much the heart of the film. The dog is used as a gateway to explore broader ideas about grief, death, art and the animal/human connection. These ideas are presented through live action footage, animation, drawing and other fascinating experimental imagery. All the while Laurie narrates in her naturally soothing tone to take the viewer on a journey through her personal life in poignant and comical ways. Those who are used to Laurie’s style will find themselves falling under her storytelling spell fairy quickly, others may take some time to adjust to the sporadic nature of the film. I was incredibly moved by this slice cinematic poetry and it quickly became one my favorites films of the year. It’s quite hard to define exactly what makes this film so affecting and think a lot of this is due to Laurie's mastery at melding together personal ideas and making them universal. Anyone who has tried to create, lost a loved one or owned an animal will surely walk away with something very touching and real. In one particular sequence Laurie speaks about the little “squiggles things” we see in the corners of our eyes when we catch it in the right light. She relates this concept to that of a mini experimental movie that is created by the body and mind intended to capture the simple beauty of seemly inconsequential things. Another hilarious scene finds Laurie telling the story of her live performance piece in Sydney, Australia were she used certain frequencies to perform to a crowd of howling hounds and yapping puppies. Her vocal delivery alone invites the viewer into her strange world of performance and dogs. There is something thrilling hearing an artist speak un-apologetically about her passions and art. One of the reasons Heart of a Dog works so well is because of its intimacy. Laurie has a knack for making the film feel as though we are having a cup of tea with and old friend that seems to love discussing simple ideas with philosophical implications. When the film came to a close I felt like I had connected with Laurie on level that many filmmakers can only dream of achieving. 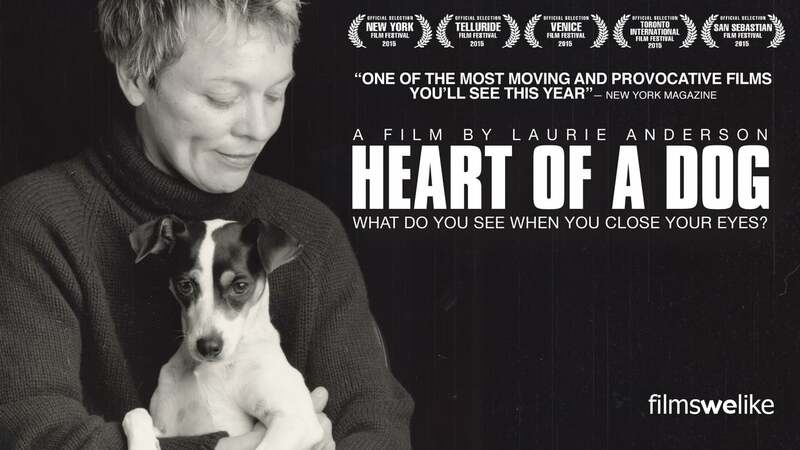 Heart of a Dog isn’t a film for everyone, but getting to spend 75 minutes with an inspiring figure like Laurie Anderson makes it something worth cherishing.